Noi Quattro opened its doors! I’m here to talk about my latest pizza mission. 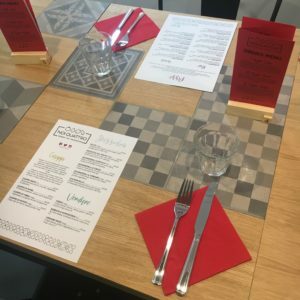 If you’ve been following these foodventures, then you know I adore Proove, but it’s in West Didsbury and sometimes you just want a pizza without having to hop on a tram for 25 minutes. When looking for alternatives in town, I went to the place everyone always recommends: Rudy’s pizza. Turns out that we had a fab experience, and one that was less than ideal, so you can imagine why I’m not completely sold on that one just yet. Just recently, and thanks to Anna from It’s a Bloggers World, I was introduced to Noi Quattro, a new pizza place (from the same owners of the well-loved and highly recognised restaurant: Pasta Factory) and I’m here to tell you that this I’ve found a new favourite in town. I’m incredibly happy to say that this is one of those places that make me want to come back instantly. From the moment you enter the restaurant, you can feel a nice vibe and a welcoming staff, which makes the ideal first impression, if you ask me. We’ve been two times already (and I only discovered the place last Thursday! ), and being as obsessed with pizza as we are, I can already tell you we’ll be visiting Noi Quattro frequently in the future. Left top: Burrata. Left bottom: Cuoppo di Mare. Right: Bufala e pomodorini pizza. The food was absolutely amazing. They have cuoppi, which are paper cones filled with delicious foods that you can share while you wait for your pizza to arrive. They have one with cheese and veggies, one with just veggies for those that are on a plant-based diet, and our favourite: one with seafood. We also tried their burrata (if you’ve seen my ‘blogger fails’ highlight on Instagram, then you know about this!) and loved the combination with cherry tomatoes and balsamic vinegar. You can’t go wrong with a simple dish as long as the ingredients are fresh. For pizza, I’ve had the Bufala e pomodorini, a white based pizza topped with fresh buffalo mozzarella and cherry tomatoes (a.k.a. a cheese lover’s dream) and Gabs tried the Napoli, which is a cheese-less pizza topped with some of his favourite Italian ingredients: capers, olives and anchovies. Both pizzas were absolutely amazing, and I was pleasantly surprised to see that they were massive, compared to the other ones we’ve had in town in the past. Next time, if we go with some starters, we might end up sharing a pizza for the two of us. Unfortunately, I’ve never had room for dessert, but maybe next time I’ll try one (and share everything with you, of course!). I’m sure anything we get will be just as good as all the other things we’ve tried so far. Thanks for reading me and please make sure to come on Thursday for a fun post, I’m sure you’ll enjoy it! Noi Quattro opens today on High Street, from the team behind The Pasta Factory. The Italian pals behind Shudehill pastificio The Pasta Factory know their dough – and now they’re proving it with their new pizzeria, Noi Quattro. Translating to ‘the four of us’ – namely Paolo Gaudino, Elisa Cavigliasso, Alberto Umoret and Daniele Bianculli – the new Smithfield Square restaurant serves a simple menu of Neapolitan pizza and cuoppi – cones full of fried street snacks found in the south of Italy. Two giant, dual wood and gas fired ovens take pride of place in the open kitchen, blasting the slow-proved dough at 400°C for 60 to 90 seconds to give a chewy, charred crust. Diners can sit at the ceramic-tiled counter to watch the pizzaioli at work or test their balance after a glass of wine on the swing-seat table at the centre of the restaurant – bound to be the most sought-after spot in the house. The menu features a range of rosse (tomato-based) and bianche (white) pizzas, with toppings ranging from simple marinara and margherita to tris di funghi (San Marzano tomatoes, garlic, porcini, chestnut and portobello mushrooms) and montanara (mozzarella fior di latte, Italian sausage, wild broccoli and smoked scamorza cheese). Like at The Pasta Factory, vegans are well catered for with options including the avezzanese (roasted potatoes, onions and rosemary) and dall’orto bio (San Marzano tomatoes, grilled courgettes, aubergines and peppers). The friends have recruited three chefs from Naples, who have also worked at Ancoats’ acclaimed Rudy’s Neapolitan Pizza, and hope their pizza will compete with the best in the city. “We saw that here were already a couple of good pizzerias in Manchester – none of them run by Italian people but really good – and the demand for this type of pizza was quite high,” said Paolo. “In the two or three other places where the pizza is good there were long queues, you had to wait a long time, so we thought there was a possibility to increase the offering. The fried snacks include whitebait, calamari, salted cod, zeppoline (dough balls) and courgette flowers, and a selection of nibbles and salads completes the concise menu. 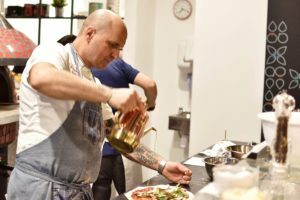 “We want to keep the same positive things from The Pasta Factory – being Italian, fresh, not a posh place, and the simplicity of it,” said Paolo. “There, we just do the fresh pasta and we try to do the best fresh pasta. In this place we just want to do pizza in this style, but we’re not going to do pasta or rice or meat or other stuff. To wash it down there’s a range of Italian craft beers from breweries including Menabrea, Baladin, Brewfist, Amarcord and San Paolo, along with wines by the glass, carafe or bottle and a classic cocktail list. Prices start from £4 for the cuoppi while pizzas are priced from £6.50 to £12. “We try to keep the prices affordable for everyone; we didn’t want to make a posh place,” said Paolo. Noi Quattro opens today at 120 High Street. Bookings are available at noiquattro.co.uk .